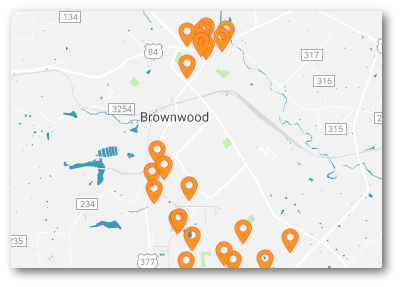 Brownwood is centrally located in the State of Texas providing easy access to all markets across the State, as well as East and West coasts, the industrial Midwest and Northeast and Mexico. Brownwood is located approximately 135 miles Northwest of Austin, 120 miles southwest of Fort Worth, 75 miles southeast of Abilene and 95 miles east of San Angelo. Brownwood is the hub of an eight county trade area: Brown, Callahan, Eastland, Coleman, Comanche, Mills, McCulloch, and San Saba. Below are the distances from Brownwood to other major cities in Texas.